This parade always is very popular in Scottsville and draws out-of-town spectators by the thousands. Townspeople joyfully anticipate the parade and jockey for prime parade-viewing spots along Main and Valley Streets. It is hard to imagine Scottsville without a Fourth of July celebration, but The Scottsville News reported such an occurrence in 1935 with an article entitled, "Glorious Fourth---But Nothing Doing." The article lamented further: "All signs point to a safe and sane and extremely quiet Fourth in Scottsville today. So far as is known, no celebration of any kind is planned to break the small town peace and quiet. It will hardly seem the 'glorious Fourth,' with no eagle to scream, no orator to soar in patriotic fervor, no baseball games, no lemonade stands--no anything in any way different from yesterday or tomorrow, except that some business places may be closed. Well, anyway, the glorious Fourth is here, same as elsewhere." 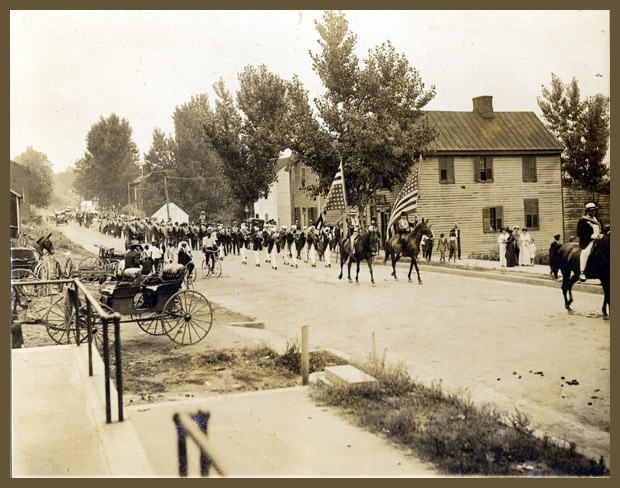 In later years, the Veterans of Foreign Wars Post 8169 sponsored the Fourth of July Parade. More recently, the Town of Scottsville and the Scottsville Volunteer Fire Department sponsor one of the largest and most colorful July 4th parades in Central Virginia. With a parade containing more than 150 entries and many visiting dignitaries, the July 4th weekend celebrations in Scottsville also include an antiques fair, flea market, live music, and fireworks. Scottsville's July Fourth has long been a special summer holiday for town and family celebrations. The 1914 photo above showing Grand Marshal, Postmaster Sam Gault, leading the marchers on horseback, with the Scottsville Band, Junior Order of American Mechanics, and the local Woman's Christian Temperance Union, is an iconic image of Southern summertime. The band was large, with lots of brass, white trousers, blue blazers, and captain's hats. 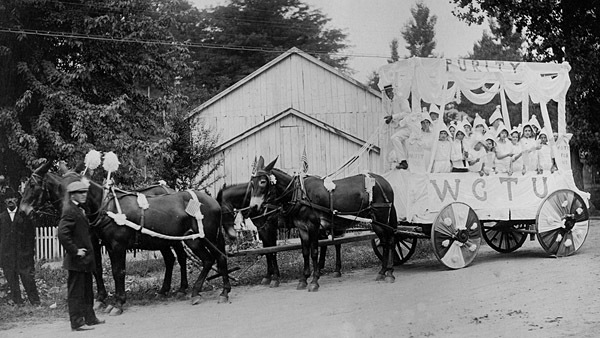 Flags waved, floats were decorated, women watched from the sidewalks in long, white dresses. Mayor Raymon Thacker remembers that between 1914 and the early 1940's, various groups would organize a July Fourth parade, including the Veterans of Foreign Wars, Chamber of Commerce, and the town. In 1935 the Scottsville News reported "Nothing Doing" that year. "All signs point to a safe and sane and extremely quiet Fourth in Scottsville today. So far as known, no celebration of any kind is planned..."
At the time, town baseball was popular, as well as homemade lemonade and ice cream. Virginia cookbooks dating to 1860 have recipes for chicken fricassee, iced calf's foot jelly, drop and beaten biscuits, cherry pudding, and cakes with 12 eggs. Summer activities reported by Ellison Bruce in his "Letters of Courtship" to Mary Estes Brown, 1911-1915, include picnics, "porch parties," dances, and tent revival meetings. In July 1915, there was a minstrel show, and another an operetta with a lawn party, but he does not mention a parade. By 1936, Thacker recalls that he and Harold Parr, a Scottsville businessman, organized the Scottsville Fire Department. Until then, the Scottsville Fire Battalion fought fires with two hoses pulled on wheels. In the 1920's, a block of Scottsville's south Main Street burned down when the Charlottesville Company, called to assist, could not thread their hoses to Scottsville's fire hydrants. Around 1942, Mayor Thacker says, the Scottsville Fire Department took on the community activity of organizing the town's July 4th parade yearly. Well-established by 1958, the Scottsville July 4h celebration included a horse-drawn buggy carrying Bob Spencer dressed as a clown, a 1922 Ford, Miss V.F.W. Gayle Stargell on the back of a Volkswagen bug convertible, and a greased pig contest; Mayor W.R. Pitts and Master of Ceremonies C.F.R. Moon, Jr., in an Uncle Sam costume, reviewed the parade from a platform at the baseball diamond, now Dorrier Park. Scottsville re-inaugurated the July 4th parade as the Scottsville Festival in 1974. As then-owner of the Canal Warehouse Frances Joseph wrote in the Spirit of Scottsville newspaper, July 29, 1983: "The town [in 1974] was still recovering from the disastrous flood of June 1972 [Hurricane Agnes]. Scottsville has seen many changes...but looks more prosperous that at the time of the first Festival." The Festival of the 1970's and 1980's offered a variety of activities. Frances Joseph remembered folk music at the Canal Warehouse and a bluegrass quartet at the Museum. Art was displayed, crafts sold, and the Museum mounted folk art and antique toy exhibitions. In 1975, the newly-opened shopping center raised money for the festival by making the "World's Largest Salad," tossed in a plastic wading pool with ingredients measured by the bushel, the public brought their own bowls and forks. In 1983, Ruth Self, who had a vintage clothing shop on Main Street, gave an extensive historical fashion show on the Scottsville Museum steps. A main attraction of the Festival, then and now, has been the flea market, sometimes at Canal Warehouse, sometime run by Doris Jones at the old school, which, Joseph wrote, "gets bigger and better every year." But the parade and fireworks have always been the headliner of the July 4th holiday. In 1983, the Veterans of Foreign Wars Post 8169 sponsored the parade; Frances Joseph noted they had sponsored parades in Scottsville "for around 30 years." Fireworks were paid for by donations from community businesses and run by Duane Karr. in 1983, a record crowd estimated at 8000 attended. 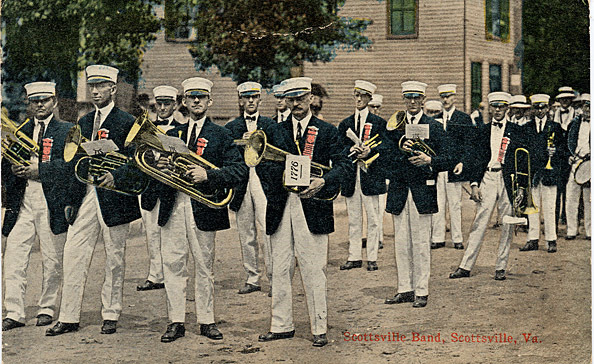 In 1984, the Scottsville Volunteer Fire Department offered a barbecue, and there were two country music shows as well as parade awards, including "couple present married the longest," and a trophy for "Best Appearing Band or Drum and Bugle Corps." Patriotic feelings fueled the mid-1970's festivals leading up to the Bicentennial. A flier lists 1974 activities, July 4-6, including the V.F.W. parade, craft demonstration and show, a Scottsville Museum musicale, town walking town, needlework exhibit, and folk music concert in the evening of the Fourth, ending with the fireworks sponsored by the Scottsville Chamber of Commerce. A folded program, paid for by over 30 Scottsville businesses, with a cover showing a packet boat on the canal, lists 1975 events: after the parade, a speech by the Virginia State Attorney General, Virginia Log Chopping Championships "open to anyone," children's games run by the Rescue Squad, and the historical pageant ($1 for adults, 50 cents for children) on the Uniroyal plant grounds--now Hyosung. This was, Bob Spencer says, a "dress rehearsal" for 1976. At the urging of various interests in Scottsville, Bob quit teaching summer school to take on this production, written by John Randolph Phillips, called "Of Town and the River." There were sound effects, costumes, many scene changes, and a large cast. As reprised ten years later, the pageant was highlighted by the Yankees riding into Scottsville on horses to set fire, harmlessly but loudly, to a trash can. In 1975 and 1976, the local Springtree Community offered a cafe in the Canal Warehouse to serve lunch -- "old fashioned food at old fashioned prices." In 1975, the price of a plate lunch was 75 cents; this turned out to be a bit too old-fashioned, and was raised "a bit" the next year. The menu included cheese, pie, egg salad sandwich, turkey and rice salad, macaroni salad, potato salad, tossed green salad, bread and lemonade or iced tea. The community's children helped make and serve the food; all profits went to the library. By 1990, ads for "Celebrate July 4th in Historic Scottsville" included the parade and barbecue, sidewalk sales, and indoor-outdoor antique show and flea market. The Scottsville Volunteer Fire Department and Chamber of Commerce were sponsoring the parade then, with John Collins the parade marshal; 15 trophies were given in various categories to entrants. In 1992, local story teller, Kathy Coleman, offered "local legends and lore" at Scottsville Museum in the afternoon; the Scottsville Baptist Church presented a concert of adult and children's choirs in the evening. The Scottsville Volunteer Fire Department was the sole sponsor of the July 4th program by 1993 and added a carnival July 1 through July 3rd. There was music Friday and Saturday nights and fireworks, as well as activities, i.e., "events too numerous to list" on the flier. In 1994, the parade began at 6 pm on July 4th; there was a ceremony at the end swearing in the new Town Council members, with presentation of certificates by the Governor of Virginia, George Allen. Then the carnival reopened, and fireworks went off at 9:30. Tim Karr was in charge of the parade. One treat of the July 4th parade has been the throwing of candy to onlookers from the floats. Christine Coleman "couldn't wait" as a Brownie Scout, to throw candy in 1995, the Daily Progress reported--she started handing it out before the parade. Another main characteristic of the parade has been noise: lots of sirens, motorcycles, reenactors' guns, fire trucks, and rescue vehicles, delighting many youngsters. In 1995, St. Anne's Parish of the Episcopal Church sponsored clowns, music, face painting, a pet show, crafts fair, and funnel cakes; the parade was at 6 pm. In 1996, the parade once more was scheduled in the morning. Governor Allen swore in Scottsville's new mayor in 30 years, Robert K. Spencer, and helped the town honor outgoing Mayor Raymon Thacker. Thacker was declared Mayor Emeritus and was presented with a silver plaque. "You'll always be Mayor Thacker," the Daily Progress reported that Allen told him. Emily Couric rode in the parade that year, in a car; Allen, as usual was astride his horse. The fireworks were postponed by rain in 1998. In 1999, there were about 150 entries in the parade, Tim Karr reported; David Cupp presented "My Friend Mr. Jefferson" at the Municipal Building. In 2001, the Rural Virginian said that Scottsville was "the liveliest place in Central Virginia" on the 4th. In 2001, the Rural Virginian said, Scottsville was "the liveliest place in Central Virginia" on the 4th. The Lions offered free sight and hearing checks in an equipped trailer at the Scottsville Shopping Center; bands played all afternoon in Dorrier Park, as well as in the evening, when Rhythm on the River presented the South Ward Band and the Hogwaller Ramblers. It's been flag-waving, candy throwing, yard sales, and bluegrass since then, with lots of crowds and difficulty parking ("You're on your own," Tim Karr told the newspaper.) The firework displays are wonderful, and the sense of a "slice of Americana," as Emily Couric called the event, is strong, Scottsville: home of the brave, especially on the Fourth of July. These three photos are part of the Anne Shirley Dorrier collection. Shirley resided in Scottsville until she passed away in 2014. She was the daughter of Thomas Ellison and Mary (Browne) Bruce.